Like most other Facebook users, I have a public page where I share updates from my blog and a personal profile which is semi-private and I primarily use it for connecting with my offline friends and family members. Most of the stuff that I share on my personal Facebook profile – like pictures of kids, songs, cooking recipes, etc. – would be extremely boring to the external world and, fortunately, they don’t get to see any of that. Having said that, I occasionally post updates on my personal profile page that could be of interest to a wider audience and I would therefore be more than happy if people – who are not my “friends” on Facebook – can see or comment on them. How can you do that without making your profile public? Facebook has just added a new option to profile pages that would let people “subscribe” to your profile just like the way people follow you on Twitter. Whenever you post an update on Facebook with the privacy set as “public,” it will appear in the news stream of your subscribers. 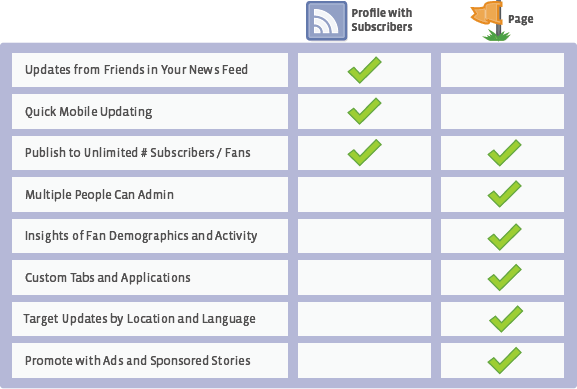 To put this in more simple terms, Subscribe is to Facebook profiles what Like is to Facebook pages. The only difference is that you get each and update when your “like” a Facebook page whereas you only get public updates when your “subscribe” to a Facebook profile. If you would like to add the Subscribe button to your own Facebook profile, go here. Before you do that, it may be a good idea to double-check that only stuff that you really want to share with non-friends is public. To confirm, go your Facebook profile page, hit the “View As” button and then click the “public” link to see what updates in your profile are public. You can have unlimited number of subscribers to your profile but you can subscribe to a maximum of 5,000 profiles. On a related note, Facebook is using the standard RSS icon with the new Subscribe feature which is confusing because, technically, these aren’t really RSS feeds – you can’t get them in, say, Google Reader.